Have a great big week! 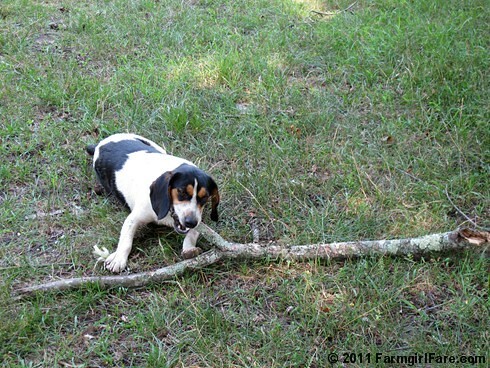 © FarmgirlFare.com, where life definitely had fewer laughs before Beagle Bert came and joined our farm family. 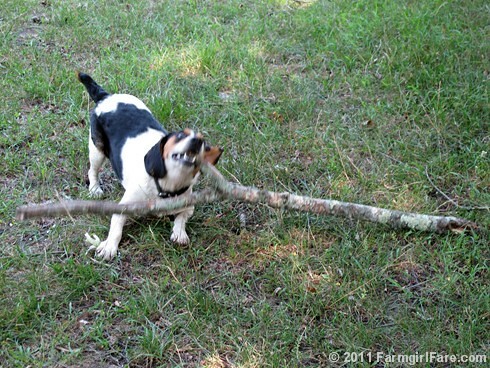 Even as a longstanding beagle connoisseur, I'm often amused and sometimes surprised that such a smallish dog can have such a large presence. Thanks for sharing Bert's antics! I'll bet Bert is sitting on the porch right now telling stories about the "big tree" that strayed into his yard and wished it never had! And, oh, if only I could be sitting there listening to him. He's just too cute. I have a bowl of your swiss chard and cabbage salad in my fridge right now. That one and your harvest soup (with yellow squash and red bell peppers) are big favorites of mine! Bert is a lucky little guy to have such freedom . My neighbor across the street has a young female beagle named Misty. She is so unhappy , constantly digging holes to try to escape.She is left in a backyard all by herself , never walked and no friends. The lady who owns her really should give her to young active family as this woman is older and says she loves beagles but ... the dog is not happy , always baying and barking. We have caught her two times already. We always had big dogs when we were young and had small children but they both lead great fun lives playing together. Now as we are older have a chiuauaha & a chiweenie who just want to be with you and are basically lap dogs. Enjoy Bert's antics, he makes me smile with each pic! All your animals I am sue make many people happy. Thanks a Bunch! Bert looks like he is having a blast!! At least his toys are cheap. Life is always better with a dog. Bert is the best! Thanks for sharing him with us - we're very lucky. These pictures of Bert would make an excellent Get Well Card. Hallmark would love you! All you need is spare time (!)........... Anything Bert always makes me smile.